The Infinity Iyashi massage chair is a chair that’s got the entire chair industry talking. Find out why. The Infinity Iyashi massage chair is one of the best massage chairs that we’ve ever reviewed. It may be expensive but its array of features and functions are well above the efficacy and quality of others. Of note, the Infinity Iyashi is the first massage chair ever to make full use of Tai Chi massage and similar techniques so efficiently, and it is also the pioneer for the L-track roller system that many well-known massage chairs use. For chronic pain sufferers, the Iyashi is a boon as it is excellent for pain relief and posture correction. Infinite Therapeutics is a company that prides itself in producing originally designed, cutting edge massage chairs. Unlike other companies that produce these chairs, Infinite Therapeutics focuses on massage chairs and nothing else – and this shows in their work. Their slogan is “The World’s Best Massage Chairs” and based on what we’ve seen, there’s substance behind those words. 49’’ Roller Track – The roller track massages the body, from the thighs all the way up to the neck. It follows the S shape of your spine, moves up and down, left and right and provides an intense and thorough full-body massage. Zero Gravity – This massage chair utilizes Zero Gravity technology, initially developed by the NASA. During Zero Gravity massage, the chair reclines while your legs rise, thus bringing your legs up to the level of your heart and consequently allowing deep breathing and relaxation. Compact Design – The Infinity Iyashi features cutting-edge, space-saving design, which means it doesn’t need a lot of room in order to successfully recline. Ideal if you live in an apartment or a small condo and don’t have too much space to work with. Bluetooth Connectivity – This is another cool little feature that allows you to control the massage chair via the free app you can get on the App Store/Play Store. Leg and Foot Airbag Massage – Airbags are located around the calves and feet and meant to provide compression massage. Perfect for relaxing muscles after a long day at work or after demanding physical activity. Shoulder Airbags – These airbags serve the purpose of gripping your body during stretching modes, but also provide massage to the shoulders, relieving tension and promoting blood flow. With these airbags, the user can reap the benefits of this chair’s stretching program, which is heavily based on Thai stretch techniques. This type of massage is known to improve posture. Perfect for individuals who spend a lot of time in front of the computer or in the car. Arm and Wrist Airbags – A set of airbags is meant to massage your arms and wrists. This massage improves circulation in upper extremities. Optical Scanning Technology – This state of the art technology detects Shiatsu massage and acupuncture points on the body, therefore providing a highly personalized massage. 6 Massage Programs – 6 automatic massage programs (Recovery, Extend, Relax, Refresh, Upper Massage, Lower Massage) and 6 different massage techniques (kneading, tapping, knocking, Shiatsu, combination, synchronic) are available. Mechanical Foot Rollers – 4 mechanical foot rollers, with 3 different levels of speed are available for targeting acupuncture points of your feet and providing ultimate relaxation. Absolutely perfect for those who spend a lot of time standing or do physically demanding work. Remote Control – The wired remote control is very easy to use and has a small LCD panel everyone can easily navigate. Lumbar Heat – Many people experience pain in the lumbar area (lower back and the bottom part of the spine) and the heating element in the chair takes care of it by relaxing tightened muscles and improving blood flow. Music System – The Infinite Iyashi has a couple of built in speakers, through which you can reproduce your own music via Bluetooth. These speakers are more than a nifty little addition – they are actually pretty good. Chromotherapy – There are a few soothing lights, subtly incorporated into the body of the chair, perfect for relaxing in the dark. This is another feature that shows how hard the designers have worked at maximizing the user experience. Waist Twist – In- seat airbags move the hips in a twisting motion and help massage and stretch the lower back. This works great for pain relief. Adjustable Timer – The user can set the massage session to last 10, 20 or 30 minutes. All of the above features can be similarly listed as the pros of the Infinity Iyashi Massage chair. Below though are the standout comments and feedback from our staff and other people who have purchased and tried this chair. Modern and space-saving design is the first thing that comes to mind when talking about the pros of the Infinity Iyashi. When finding the right spot for your massage chair, just a an inch or so of space against the wall is enough. This is because when the Iyashi tilts, the whole base slides forward. Other massage chairs tilt from the bottom thus needing more inches from the wall. When the Infinity Iyashi first came out, it was the first ever massage chair to have the L-track roller system. Unlike the S-track system that stops at the lower back, the L-track goes on to massage your buttocks and your thighs. It was a revolutionary innovation at the time and nowadays, many massage chairs boast of an L-track roller system. In addition, the Iyashi has the distinction of having the longest L-track system at 49″. The longest traditional roller tracks we know stop at 32″ so you can see the huge difference. 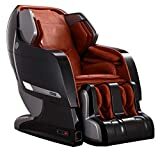 If you have a physical condition whereby you can benefit from a massage of your hamstrings, glutes, and piriformis, this massage chair is an excellent choice. This company is called Infinite Therapeutics and this chair lives up to that name. If you get on this chair burdened with chronic or acute pain, or pain in your shoulders, back, neck, or whatever part of your body, you’ll feel a huge difference with just one use of the Iyashi. Now imagine regular sessions and you can see what an investment it can be despite the premium price. If you’re interested in posture correction, you can consider both the Iyashi and the Inada Flex 3S. The Iyashi uses its airbags and massage rollers to bring back your spine back to its natural curvature. The Infinity Iyashi has way too many cool features and functions that we love so we’ll just rattle of a short list here. We love that for the zero gravity feature, you get two gravity positions AND the whole chair tilts up. It brings the whole massage experience to another level as the pull of gravity makes you feel the rollers even more. We love how the foot rollers can be extended too. It makes the chair uber comfortable and a good fit for people with longer legs. We don’t get to say this often so when we do, we’re very happy to report that the Infinity brand can boast of its excellent Customer And Tech Support team. They’re knowledgeable, very helpful, and patient with customer problems and issues even when the problem is tricky to troubleshoot. At its price point, it is on the high end of chairs we’ve reviewed. If you’re on a tight budget and shopping for a cheap massage chair, then this brand is not for you. Yeah, we’re kinda stretching a bit for something bad to say… Unlike the smaller Human Touch chairs, the Infinity Iyashi comes in 3 boxes and assembly is required. Delivery is usually curbside so if you want it brought inside your home, we’d recommend availing of the White Glove service. The Infinity Iyashi may have been introduced to the market 3 years ago but it’s still going strong in the market. It’s obvious why due to its excellent features and functions that truly deliver results. The Iyashi is high on both design, functions, and quality. Add to that its therapeutic benefit of relieving pain and correcting posture and it becomes an appliance that would be so indispensible to have at home. The Infinity Iyashi is on the expensive end. However, you can’t really put a price tag on health and well-being and no one is rich enough to buy “cheap” massage chairs that serve no purpose except taking up precious space in our apartments.